I know people that have lived in Kinston, NC their entire life, and when talking with them about the history of the town, it breaks down into three eras: the good old days, the bad times, and the new resurgence. The bad times included, apparently, gangs, but the resurgence has been around great restaurants, delis, and breweries. Some of the more well-known ones are The Peach House, the Chef & the Farmer (subject of the PBS show, A Chef’s Life – https://www.youtube.com/watch?v=A35ZvJBa7PY), the Boiler Room (also a common location on A Chef’s Life), Mother Earth Brewing, and the Queen Street Deli. And Kinston may be perfectly situated to hold onto this resurgence. Sometimes small towns experience a growth like Kinston, but it cannot be sustained, because the town is naturally dormant – lacking a consistent flow of new people and styles flowing through the community; comfort zones are found quickly and just as quickly encased in cement. Kinston may have felt like one of those towns, before this most recent resurgence, but my prediction is that this new growth in food and drink, and maybe soon music and art, will be sustained. Forty minutes from Greenville, NC, where Eastern Carolina University is set, and ninety minutes from Raleigh, Kinston, NC could be the eastern equivalent to an Asheville, NC. Most recently, I visited the Queen Street Deli. It’s a popular location, and they have two rooms of tables to seat all the patrons. This doesn’t include a steady stream of people ordering to go, or just coming in for a coffee, a cookie, or a piece of cake. They make breakfast, lunch, and they are a popular caterer for the area. There’s even a library of books in the back that you can borrow from. So be prepared for a wait. If you want fast, there’s a McDonalds somewhere nearby. If you want a very good sandwich, make your order, grab your number, and find yourself a seat. I recently ordered their Cuban sandwich. Now, this is the second Cuban sandwich that I’ve written about, and I plan to write about the place that makes the best Cuban sandwich in all of North Carolina very soon. That won’t be here, however. That won’t be the Queen Street Deli. While they do make a very good one, it’s not quite the best. Up in Asheville, at The Gourmet Chip Company, the first Cuban sandwich I wrote about, I wrote mostly about the chips, and how the fine restaurant does well at putting all the correct ingredients together when making their chips and their sandwiches, but they did nothing to differentiate the whole sandwich from the ingredients. The end result, in other words, didn’t surpass one’s basic expectations. And while the Queen Street Deli does not make the best Cuban sandwich in North Carolina, they make one helluva good one. 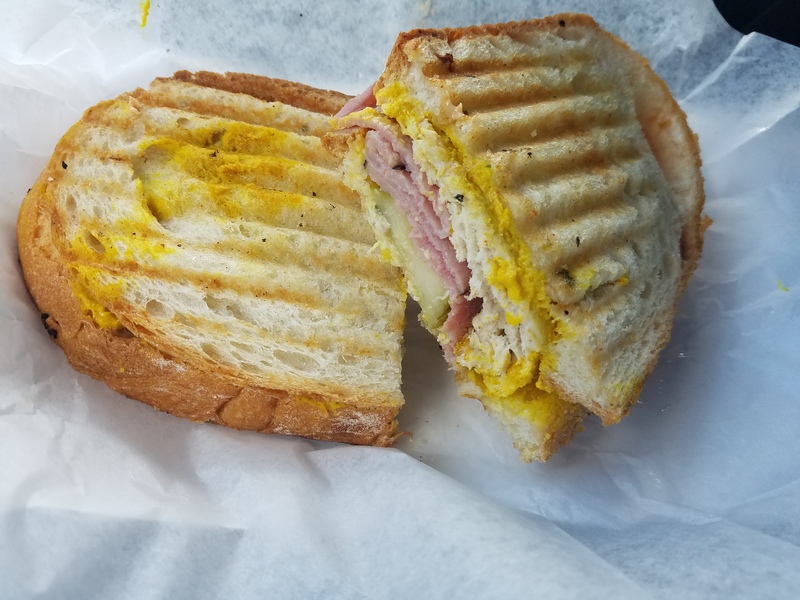 If you are going to go to the Queen Street Deli, if you are going to see an ECU football game, and you’re willing to travel a bit for a good sandwich experience, order the Cuban. Order it with a nice coffee, and a large slice of cake. Unless you are frequently traveling to or through Kinston, don’t waste a visit with just a sandwich. Make your order, make it large, get your number, and find your seat. Wh that, I hope Kinston, NC handles the on-coming rains from Hurricane Florence well. Next Foothills Brewing -Winston-Salem – and yet another Cuban!